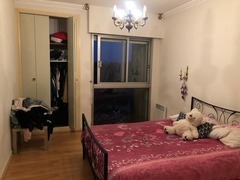 Furnished studio of 20m2 composed of a kitchen open to living room, sleeping 7m2 mezzanine, shower room. Renovated, bedroom, cellar, bike room, 2 balconies, parking. Studio overlooking courtyard with beautiful kitchen (plates, hood, fridge), water and collective heating. Station, T1 in perfect condition, Hyper Center, big street, ..